This video is presented by EA Game Changers. If I am a fan of BioWare games, will I like Anthem? If you’ve asked yourself something along this line… well my friend, we got a lot to talk about. Hi! Ashe here. Nice to see you again. A month ago, BioWare and EA were kind enough to fund my trip to Sweden so I could head over to EA DICE to check an early build of Anthem. And today, I’m finally able to talk about it. I’m sure at this point, most of my fellow compatriots/influencer peoples are chatting up Anthem. Weapon damage, Javelin effectiveness, tech combos. That’s all fine, but for me, I’m not a looter shooter gal. I’m not from the Destiny community. Haven’t tried Warframe. The last raids I ever did were in World of Warcraft’s Burning Crusade. My main jams—what I really care about—are story and characters. I’ve played everything between KOTOR and Mass Effect Andromeda, and would be what’s considered a modern BioWare “Core” fan. (“Modern” because I’m not including Neverwinter Nights or Baldur’s Gate. EDIT: AND WE DON’T TALK ABOUT SONIC) And judging by those who’ve stuck around for so long—and thank you by the way—it’s very likely that most of you were or are a fan of BioWare’s games. And so, we’re here. I’ve played Anthem. A fair 5 hours in of an earlier build that probably will change before the release. But regardless, the question still remains: If you are a fan of BioWare games, will you like Anthem? And the answer is… it depends. My idea of what makes a BioWare game a “BioWare” game may be very different from you. I focus on characters and story, but there’s also crafting. Customization? It’s not in this game, but romance? Decision making? Player character agency? There’s a lot of factors here, but I feel we can sort it out together. What do you look for in a BioWare game? What makes you want to play one? What makes it worth your time? What you’ll see from me in these upcoming weeks leading up to Anthem’s release is answering these questions and, eventually, the overall question of “Will you like Anthem?” It’s not my job to make you pre-order the game. It’s not my duty to make you buy any game. What I personally enjoy is sharing what I know, so you can make informed decisions with your wallet and time in mind. I also like making sure BioWare stays on their toes and makes better design decisions as the years go on. This time, we’re talking about how it works to play Anthem as a Solo player in an online-only, multiplayer world. While Dragon Age and Mass Effect introduced multiplayer into their latest games, BioWare games traditionally are enjoyed alone. Anthem is the first online-only, co-operative focused game BioWare’s made. How will it fare with its core audience? Let’s establish the ground work. What you’re watching is me playing through the “Lost Arcanist” mission early into the story as an Interceptor, by far the best Javelin and only Javelin I will ever play. How this runs is pretty simple. If you watched BioWare’s previous livestreams, you’ve already seen the beginning. You and your Cypher partner Owen head to your Javelin, then realize you got bamboozled into meeting an omega-weird Corvus spy named Tasslyn. She wants you to find an Arcanist researcher named Matthias cause he’s probably bleeding and dying in a ditch somewhere. Simple, clean-cut mission. We just started the beginning of your Freelancer’s story. You just took off your training wheels. You’re getting used to jumping. Flying. Not dying. Now since you’re checking out this vid, you may be less interested about Javelin comparisons, weapon combos, loot tables… and you may be more invested in the characters we meet. And in this case, rescue. That’s fair. It’s what BioWare is strong at. And so far, I’m a fan of what the flow of this game looks like. Let me draw it out for you. You have your Critical Path mission—your main mission—which is the “Lost Arcanist” quest we’re on right now. You finish that up, rewards in hand, and then head back to your hub Fort Tarsis. At this point, you can jump right back onto the Critical Path. Or, you can explore the city a little. Or a lot, depending how far into the story you are. Talk to the townsfolk. Maybe other Freelancers. Take in the scenery. And once you’re done with talking to as many people available you want or quests fulfilled, you can head back onto the Critical Path. One of the questions I’ve had a lot on this game is “How is Anthem as a solo player? Should I try doing quests with others?” From what I played, it works. The characters I’ve met so far in 1-on-1s are interesting, believable in the world. The game offers different difficulty levels, and playing on Normal in this build was a good balance between facerolling and yelling F bombs at my monitor. You’ll likely become way more attached to Fort Tarsis, as all the characters you want to meet are there. 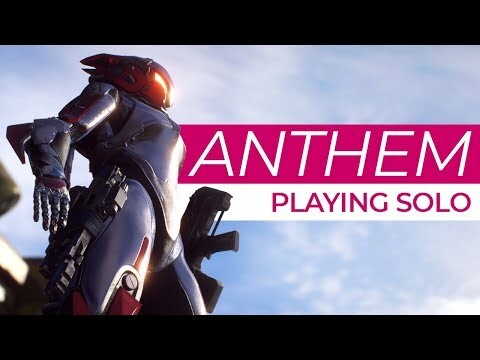 What I predict will be an actual problem for core fans is balancing the idea of playing with other people, the main thing behind Anthem’s “Strong Alone, Stronger Together” motto, with playing alone and experiencing Anthem’s story. While the Critical Path flows through your adventures in and around the world, from what I’ve seen, character growth mainly shines in the Fort. I sense it will be a more enriching experience if, after every main mission, you stop into the Fort and clear every conversation and activity before you jump back into the main story. Obviously this is a problem if you have your friend on Discord or VOIP yelling in your ear to hurry up. If you’re dead set on playing as a solo player, you’ll be fine of course. Playing alone seems very doable if you take your time in between missions to absorb what’s going on while the story progresses. As far as the world outside the walls, this mission’s pacing reminds me of what I experienced as a solo player in SWTOR. Where you’re supposed to be having these social spaces, you end up having a lot of moments of silence. Less fun, more grind. Let me explain. In SWTOR, there are hubs where you’ll have personal, 1-on-1 face-to-face conversations with NPCs. Good stuff. But in order to progress those relationships along, you have to go outside, kill some baddies, and get work done. And these spaces in between hubs are HUGE. The whole “kill some baddies, get work done” part tends to be really quiet when you’re a solo player, where if you’re not playing with others in this massively multiplayer online game, you kind of go through the motions to get from point A to point B. Well, just in case you didn’t know, Anthem is an always-online multiplayer game under the same developer name. But, thankfully, there’s a noticeable difference. While you DO have to “go outside, kill some baddies, get work done,” even if you don’t have a friend or awkward 12-year-old rando scrando on the mic yelling in your ear, you have your cool guy cypher Owen along for the ride. “Let’s check this beacon. Oh, everyone’s dead. Please kill stuff. Good job! You’re a Grabbit-killing monster.” And so on and so forth. You feel a lot less alone out in the world because of him, and while being outside isn’t nearly as reactive as being in Fort Tarsis, his presence fills a lot of the silence. I can’t tell yet whether we’ll eventually tire of him and if there’s enough lines for him to not sound like he’s regurgitating phrases, but for the time being, I enjoy the company. So, does Anthem look like a good game to play as a Solo player? At the moment, it looks like it. Again what I played isn’t the final product and may/will/possibly/maybe change greatly before release, but how it looks is trending positively if you’re planning to play by yourself. However, the game is a co-operative experience. If a player is struggling between doing missions side-by-side with friends and experiencing the story and its affects on the Fort by themselves, what’s the better play? Or can they have both and be satisfied? In the next vid, we’ll take a look at more factors and more Anthem, explaining gameplay in more detail and how it may or may not be relevant to your interests. Thanks for watching! If you have more questions on what you’re seeing in the video or what we talked about today, let me know in the comments. Or join the BW Outpost community on Discord! Link is in the description. You’ll be able to find me and other BioWare fans there, and we’ll be having our first meetup at PAX South next week! Details are in the Discord, feel free to join us 🙂 I’m out, like subscribe for more. But more importantly, thank you for watching. I’ll be on Twitch later this week to do non-BioWare things, so feel free to catch a livestream by following my channel there! See you soon.